The standard of care for patients with cirrhosis is based on individual management of each of the complications of the disease. Currently, there is not an overall therapeutic strategy based on a mechanistic approach to complications of cirrhosis. The current standard of care is clearly insufficient because mortality rate is still very high unless a liver transplant is performed. In this regard, it should be emphasized that liver transplant is a solution for only a small proportion of patients. In fact, the average number of transplants performed per year in Europe is of approximately 5,500 while the estimated number of deaths due to cirrhosis per year in Europe is of 170,000. Therefore, the majority of patients cannot be treated with liver transplantation, mainly because of insufficient organ donors. we ensure efficient operational management including that of administrative, financial and legal issues The goal of this WP is to establish and guarantee full synergy, motivation, integration and effective interactions among LIVERHOPE participants. we conduct a multicenter, phase 2b, double-blind, placebo-controlled trial in adherence with the approved study protocol, to evaluate the safety and tolerability of oral administration of simvastatin plus rifaximin in patients with decompensated cirrhosis. The trial is conducted in 9 European referral hospitals in France, Germany, Italy, Spain and UK. we conduct a phase 2, multicenter, double-blind, placebo-controlled trial to evaluate the safety and efficacy of oral administration of simvastatin plus rifaximin for a 12 month-period in halting disease progression and reducing the development of acute-on-chronic liver failure in patients with decompensated cirrhosis. The trial is conducted in 9 European referral hospitals in France, Germany, Italy, Spain and UK. serum, plasma, and urine samples are collected at all participating sites and stools at the coordinating site following standard operating procedures (SOPs) shared by all the clinical sites. The samples are collected at IDIBAPS for biobanking and analysis. IDIBAPS is in charge of coordinating the activity and maintaining a master list of the clinical material, its distribution and destruction. 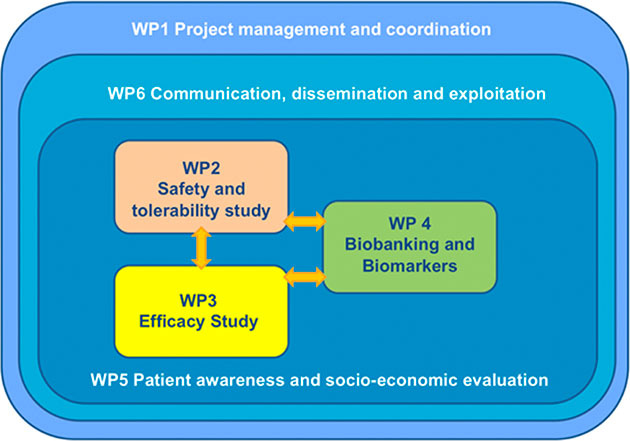 The WP4, is also aimed at predicting and identifying biomarkers of response to treatment by exploiting the capabilities of systems biology approaches developed by partner Anaxomics to integrate and jointly analyse all the data in a mechanistic context. we are highly committed at bridging the gap from scientific community to new commercial interesting therapy and to patient-focused results and approach. We want to raise public awareness and inform patients and public about the ongoing study and results. We also perform health-economic analyses to demonstrate the enhanced benefit/cost ratio of the new therapy into clinical routine. The participation and activities of the European Liver Patient Association (ELPA) , the European Foundation For The Study Of Chronic Liver Failure (EF-CLIF) and the Centre for Research in Health and Economics (CRES) of the Pompeu Fabra University in Barcelona in this WP are an added value to the action. 1. Participation to event and event organization like conferences, workshops, academic courses, meetings, patients´ forum, cultural events, discussion groups within communities. 2. Development of products as: articles in peer-review journals, with abstracts for patients,, reports, articles and features in local mass media (e.g. radio, television, and newspapers), brochures, flyers, course materials, product of highly visible impact, such as posters, brochures, websites and electronic communications, videos presenting project topic and progress, spot advertising and streaming of events will be produced on demand. c) Participation of scientists involved in the project to national and international congresses. Particular attention is also devoted to the exploitation of the project results, that will be transferred to and absorbed by the project industrial stakeholders (Anaxomics and Alfa Wassermann), thus generating new business and revenues.